In 1851, George Phineas Gordon, a New Yorker, patented the first of his platen jobbers, whose now-familiar design formed the basis of almost every floor-model platen jobber to follow. Gordon’s jobbers soon replaced those designed after the Ruggles Card & Billhead, an early platen jobber and the first with a vertical bed. Gordon’s Franklin, an improved version of his early clamshell jobbers, became the single most famous and influential jobbing press of the nineteenth century. The platen jobber speeded the production of large runs, and by 1894 numerous firms were manufacturing Gordon or Gordon-style jobbers, under such names as Baltimore, Challenge, Clipper, Eclipse, Favorite, Jones, Leader, Minerva, Samson, Star, Thorpe, Universal, and Washington. (See also the Damon & Peets 8×12, Golding Jobber, Pearl Improved, and Perfected Prouty.) The Franklin, so named because Gordon claimed that Ben Franklin had described it to him in a dream, should not be confused with the Franklin common press, an early wood hand press from Franklin’s own shop. 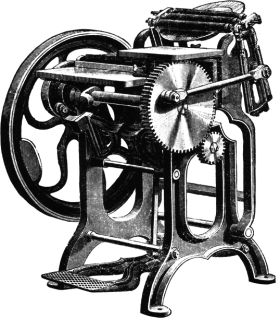 The primary features of the Franklin were the vertical or slightly sloping bed; inking from from rollers automatically connected with the motions of the platen; and a rotating ink disc that provided a new surface for the rollers every time they reached it, thus distributing the ink more evenly. Gordon added further improvements to his design in 1872, hinging the platen and bed together, and incorporating a throw-off. In 1901, Chandler & Price bought the old Gordon works and the right to use the name “Gordon,” though they had been building a near-copy of the Gordon Franklin since 1886, the Chandler & Price Oldstyle.